2019 Average Cost to Install an Outdoor Outlet - How Much Does it Cost to Install an Outdoor Outlet? 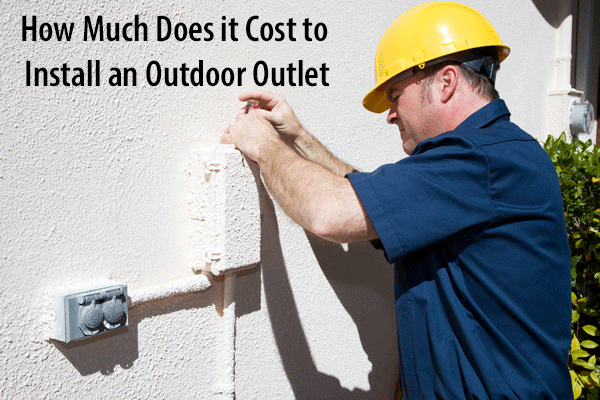 How Much Does it Cost to Install an Outdoor Outlet? Generally, it will cost between $350 and $400 including labor and materials to install an outdoor outlet for a newer home. If the home is older and needs additional wiring or electrical panels installed, the average price ranges between $1,000 and $1,400. Cutting through and repairing drywall will add to the total cost. Whether you're looking to power electric landscaping tools, plug in holiday lights, install mood lighting for a patio or deck, or power decorative features, an outdoor outlet makes the task much easier. Since an outdoor electrical outlet is susceptible to the elements, it needs to include weather protection in addition to the ground fault circuit interrupter (GFCI). The GFCI protects the outlet, as well as anything connected to it, if it comes into contact with water. For outlets powering items you regularly connect and disconnect, weather protection needs to be no more than a plastic cover that opens and closes over the outlet. If the outlet will be used to power items that remain plugged in indefinitely, such as decorative features, you want an in-use cover. Cost varies mainly according to how difficult the installation is. The difficulty of installing an outdoor outlet depends greatly on the age of the home, the location of the outlet, your location and its average electrician rates, and whether you need to also install a new electrical box. How Much Does Installing an Outdoor Outlet Cost? Costs vary widely according to where you live, as electricians charge drastically rates in different parts of the country. Expect to pay, on average, between $75 and $150 per hour if you hire an electrician to install your outdoor outlet. The total cost will depend on how complex your job is. For example, if the electrician needs to install an electrical box, this takes more time and adds to the overall cost. If you need additional wiring or electrical panels, which is common for an older home that has fewer interior outlets, the average price ranges between $1,000 and $1,400. For the average newer home, though, you're looking at around $350 for your installer's labor, with the cost of the outlet itself averaging between $25 and $50. Since the main item determining the cost of installing an outdoor electrical outlet is the time required to complete the job, you need to look at the factors that might increase that install time. Age of the home: Older homes have fewer indoor outlets, which means they also have fewer available power sources for a new outdoor outlet. This raises the odds your electrician needs to install additional wiring or electrical panels, adding significantly to the time required to complete the job. 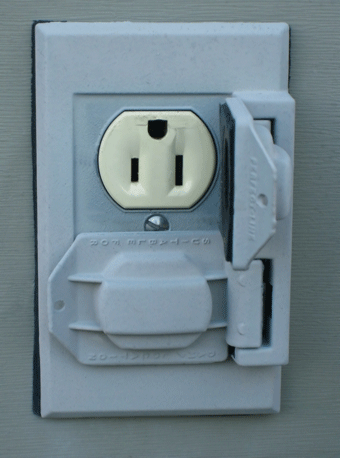 Outlet location: If your outdoor outlet is installed in an area with existing wiring or access to an electrical box, it takes less time to install and reduces labor costs significantly. Of course, the opposite is also true. Electrical boxes: Most of the time, an outdoor outlet needs an electrical box, sometimes called a junction box. These significantly improve the safety of your outlet, as they help maintain a connection and prevent fires. Installing one adds to the overall time the job requires. Drywall: Your electrician may need to cut through the drywall to install the outlet. This, as well as repairing it, it may add to the overall price. You want to protect yourself and your property by hiring a licensed, insured, professional electrician. Luckily, the Internet makes it easier than ever to research contractors before hiring one to complete your install. First, make sure the electrician is licensed to work in your state. You can do this by checking the state's labor department site or licensing board to ensure the electrician has an active license. Once you know that, check the Better Business Bureau to see whether there are complaints filed, as well reviewing as consumer rating sites. Next, make sure the electrician obtains the necessary permits to complete the job. Unlicensed electricians don't have this ability; a lack of permits indicates he or she is unlicensed. As far as insurance, you want an electrician with ample liability insurance, preferably at least $1 million. This protects you and your home if there's an accident. Finally, always request quotes up front, preferably from at least three providers. This allows you to compare costs to ensure you get the best contractor at the best price. If you have any other projects you've been putting off because you weren't ready to hire an electrician, this may be a great time to take care of them. Bundling your projects may save you some money, particularly if the electrician includes a minimum trip or travel charge and you don't expect the installation of your outlet to meet that minimum time requirement.